Custom Toggles, Switches, Buttons, Spinners, etc. The GLG Toolkit contains a large collection of dials, meters, gauges, custom buttons and toggles, and many other widget components. 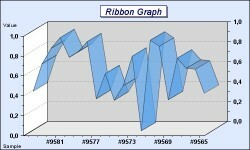 The components may be used as individual widgets or combined into elaborate dashboards that contain multiple widgets. Each widget can be updated with real-time data and can take user input. All GLG widgets are highly configurable and may be customized using the GLG Graphics Builder. 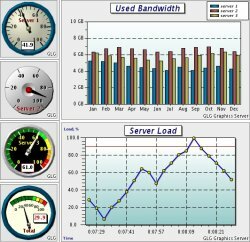 The Graphics Builder may also be used to create custom instrumentation dashboards or control panels, as well as create new widgets with custom look and feel. At run-time, an application uses the GLG library to display the widgets, update them with real-time data and handle user interaction. Various deployment options are available for a variety of programming environments and platforms. 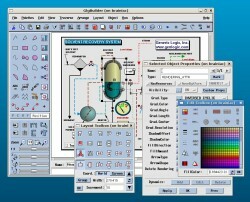 In addition to the Dials, Meters and Gauges, the GLG Toolkit includes the Graphics Builder, Real-Time Charts and many other components, as well as a choice of C/C++ DLLs, a C# User Control and a Class Library, an ActiveX Control or a Java Class Library for embedding GLG widgets and components in desktop applications. An ASP.NET or JSP Graphics Server is also provided for Mobile or Web deployment.